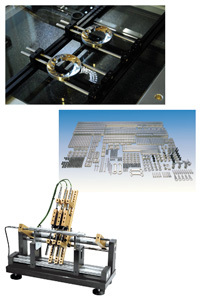 Fixture systems for measuring and production applications. DF-System is a new fixture system developed and produced by Schut and designed for 3D product fixtures, particularly for optical measurements. Alufix is a flexible fixture system made of high tensile aluminum, also used in the aerospace industry due to its high clamping force. MF-System is a universal construction system based on components to quickly and easy build custom measuring fixtures. For over 15 years Schut designs and builds custom-made solutions in the shape of measuring fixtures and measuring machines for users in countries all over the world.